Welcome to the George Clooney movies fanlisting! As an actor, Oscar-nominated director and producer, George Clooney has been involved in over 35 films. His filmography ranges from popcorn-friendly fare like 'Ocean's Eleven', 'Ocean's Twelve' and 'The Perfect Storm', to more personal films such as 'Out of Sight', 'Solaris' and 'Good Night, And Good Luck'. His production credits also reflect this film diversity, with his production company, Section Eight, producing critically successful and smaller films such as 'Far From Heaven', 'Confessions of a Dangerous Mind' and 'Syriana', as well as bigger, box-office successes, like the 'Ocean's' series, in order to fund their smaller films. George's most recent film releases were 'Good Night, And Good Luck' and 'Syriana'. He recently completed filming 'The Good German', directed by his Section Eight partner Steven Soderbergh, and is currently shooting 'Michael Clayton'. The aim of a fanlisting is to create a list of all the fans of a particular subject; with this site, fans of George Clooney movies. Please look around the fanlisting and if you're a fan of this talented actor/director/producer's work, please consider adding your name to the fan list! The George Clooney movies fanlisting was last updated on 29th March 2019. There are 89 fans listed, with 0 waiting to be added and the newest member is Kaily. 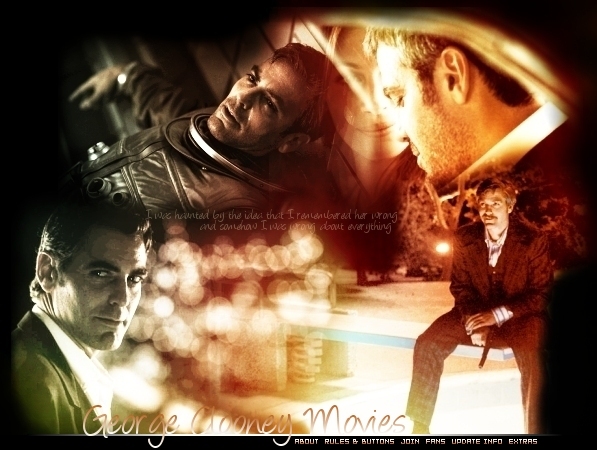 The George Clooney movies fanlisting was created on 15th December 2004 and uses the Enthusiast script.